1. This ZP29E rotary tablet press is added with 2 sets of worms and gears for convenient and easy adjustment of pressure. 2. Due to the digital display of pressure adjustment and filling process, operation errors are hardly to appear. 3. The worm drive box is assembled with integrated worms and an additional set of bearings mounted at the lower part of the main shaft, where the worm gear is installed, increasing its overall efficiency. 4. The opening units for the transparent organic glass doors of the pressing chamber are totally placed at the top of the machine. Thus the pressing chamber is bright and easy for internal cleaning and maintenance. Meanwhile, integrated stainless steel baseboard is utilized to prevent the powder from leaking into the cabinet. 5. Our rotary tablet press employs interchangeable standard upper guide rail, which needs to be changed one circle of rail only after long term use. There is no need to dismount the top cover and change the pedestal of the guide rail. In this way, it helps effectively to save time, labor and cost. If needed, this product can be configured with sensor for adjusting pressure, PLC with touch screen for setting and presenting data, and USB port for data collection in the pressing process. 1.The double-press rotary tablet press is capable of forming circular tablets in large diameters and irregularly shaped pills in different specifications. With nonstandard dies, it gets the granular materials pressed into tablets through double sided ejection. The maximum diameter of the round tablet is about 25mm. 2. Through precompression and main compression process, the quality of tablet is significantly improved. 3. Digital display of adjustment unit with hand wheel facilitates precise and flexible operation and simplifies the filling and thickness adjusting process. 4. Our rotary tablet press uses continuously variable speed regulator for convenient, safe and reliable operation. 5. 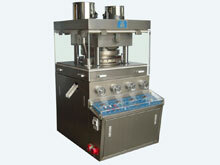 If overloaded, the machine will stop automatically for it is mounted with overload protector. 6. Aside from the stainless steel enclosed outer housing, all parts in contact with medicine are made of stainless steel or coated to be nontoxic and corrosion resistant. Moreover, the turret is also processed with special surface treatment against cross contamination. 7. In the pressing chamber, safety lighting fixture is applied. 8. Our product is capable of making double colored tablets in accordance with customized needs. The ZP29E rotary tablet press is manufactured in compliance with New GMP standard, and its maximum production capacity is of 83,520pcs/h. With more than 30 years of experience in manufacturing and sales, FEIYUN is able to produce a wide range of pharmaceutical machinery, such as capsule filling machine, tablet coating machine, capsule polisher, medicine pack blister packaging machine, medical high purity nitrogen generator, etc. If you want to buy quality pharmaceutical equipment from China, please let us know and we have what you need.